join me and go home to get all of your change. I felt my eyes well up with pride for a fourth grader I would never know. A fourth grader who knew that trying times call for heroes of all sizes and sorts. A fourth grader who asked his fellow students to go home and "get loose change from your piggy banks." I don't know about your states, but mine is hard hit by this economy. With some of the most underfunded schools in the country, our schools face even deeper cuts and tense decisions. With unemployment rampant, parents I know spend the day in search of a job or the night worrying that they'll lose their job. Nothing demonstrates who we truly are, though, than hard times. It requires little to be generous when we're flush. It's sharing when we have little. Working harder when we're already exhausted. Volunteering for longer hours, giving what we can, attending one more meeting, being one body that agrees to help. Last week, I wrote that I believe we are better than what we have become. The flier in my son's box is proof. So is the substitute teacher who stood up in this morning's budget meeting and pledged to work 10 days next year for free. And the single mom who works full time but finds time after she tucks her kids under the covers to create a cooking program based on "real food" or to sign the school up for a green fundraiser. And the father working two jobs who started a bottle and can drive to encourage recycling and raise money for the school. And each and every parent who hauls recycling to the curb when it's cheaper to just throw it in the trash because we want to teach our children the importance of responsibility, of treading lightly on our planet. So too is the family that splurges on one dinner out a month but makes sure to tip the waiter extra to help him through hard times. And the farmer at the farmers' market who, despite the possibility of losing her farm next month, hands my son a couple extra oranges. And also the graphic designer who, when laid off, offers her services to a local green group for free. The truth is, as much as they bickered and traded up on Capitol Hill, the real stimulus package will not come from the people we elect. It is not a matter of billions spent here or tax cuts made there. The real stimulus package is us. Our generosity. Our dedication. Our creativity. Our willingness to think not of "me" and "you", but of the collective. There's only one way we come out whole on the other side of this economy, this ecological crises. Clutching the flier in my hand, I head home determined to start tomorrow with a jar full of coins and a heart full of hope. Thank you so much. We all need a little light in our day. The littlest people can make the biggest difference, can't they? 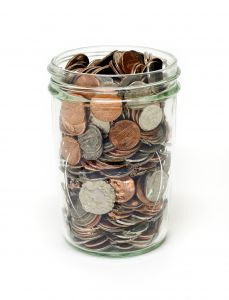 Our state is facing the same sort of budget cuts for next year, so maybe some boys of mine ought to think up a coin drive or a bottle collection effort? That post brought tears to my eyes! This is truly brilliant and incredibly touching. Very beautiful sentiment. Thanks you. It is so hard to see how the downturn is affecting friends, and so sad that kids have to deal with this. But maybe this will help them to be less focused on consumerism as they grow up. What a great post. I see when times are tough, we're falling back on family and friends. My brothers come over to borrow tools from my husband, my husband spends more time helping out his parents, my mom and I look for ways to save money, my sister-in-law and I talk about pooling our canning resources for next year. This lack of money has brought our families closer together. Wow! Thank you for posting this. If everyone would come together we could stop this down turn. I'm doing some bookkeeping work for a local school and am amazed at how little some of the teachers make. Its such a shame that teachers don't make what they're owed - creating tomorrow's citizens. Wonderful post, GB. I've been working on starting this business, and these are a lot of the things we've been talking about. How to bring people together to work for a better tomorrow! Awww, that kid's giving me chills! Kids rock. Love your post. I agree -- people are pulling together and very aware that we need to watch out for each other these days. While I'm slowly moving up the ranks over my 6 years... I still make about half as much as veteran teachers. And we do the "same" job. Abbie, it absolutely goes without saying that our teachers are underpaid and undervalued. I wonder what it says about our culture that those who do the most important work - molding our future - are paid so little. And those who can hit a homerun or make a B movie or head up some company that makes other companies "more efficient" make millions. That was REALLY good; thanks. What a way to start my day! Granted, I am two days behind reading your awesome post. I sent the link out to some friends that I know will love it too. Well done!